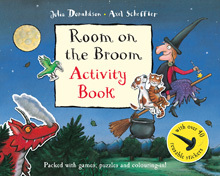 A great value activity book packed with fantastic games and activities featuring characters and scenes from the bestselling ROOM ON THE BROOM. Includes puzzles, colouring-in, join the dots and more. There's even a sticker scene with over 40 reusable stickers, so you can have fun creating your own stories again and again!